(Bloomberg) -- Europe’s leveraged loan market is finally up and running again. More paper launched last week than in any week since early November at 3.5 billion euros ($4.0 billion), according to date compiled by Bloomberg. Nearly all of it supports M&A activity, and more is set to come. The buyout of U.K. catering business WSH Investments Ltd. reached formal syndication Monday and the debt backing CVC Advisers Ltd.’s take-private of tool hire business Ahlsell AB should also launch soon, according to people familiar with the matter who declined to be identified. The new issuance in Europe will test investor appetite and re-establish price points after an extended quiet spell. Deals struggled in syndication in late 2018, and fresh loan supply this year has mainly been confined to small add-ons and refinancings. Lenders will attend bank meetings tomorrow for Univar Inc. and a 1.7 billion euro term loan for Amer Sports Oyj. Commitments are also due on a cross-border refinancing for Getty Images Inc.
Further ahead, investors expect to see a jumbo buyout financing for Johnson Controls International’s power solutions unit. That deal, which is currently being quietly shown to investors, could be split across $8 billion of loans and $2 billion of bonds -- although the mix is not yet certain -- and may include a euro portion. The new supply offers some relief to CLO managers who are trying to build up loan portfolios. 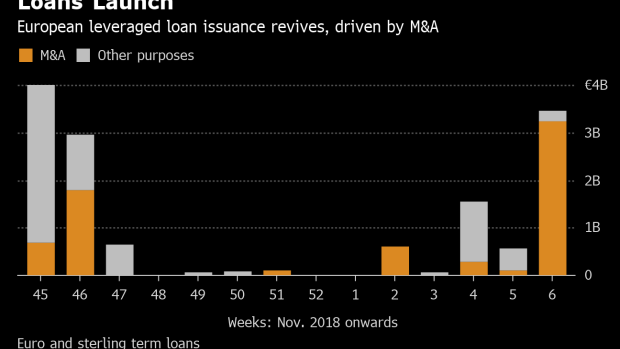 But arrangers say the pipeline beyond this batch of issuance still looks thin, so the latest raft of deals may not be sufficient to force private equity sponsors to tighten documentation.